Medium-sized and large offices are now choosing print partners that are real achievers: this printing system. This high speed laser printer with 600 MHz processors and a huge user memory transfers all your required documents from PC to paper in a matter of seconds. Whatever you send to this system from the office network will be printed at 40 pages respectively, considerably boosting user productivity – saving yout time and money in the process. And of course the high-grade components make for reliable and environmentally friendly machines. 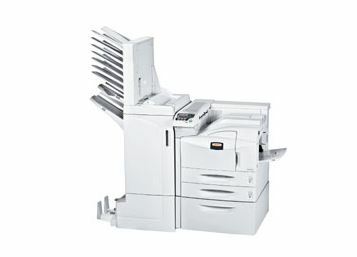 This printing system also score high points for their range of printing options, from A6R to A3 formats and a optional data security kit. It`s not only about simple printing of text and images: these two professional tools are the ideal solution for large-scale printing jobs. The optional finisher extensions help sort, staple, fold and punch holes. Speed is the highlight of this printing systems, but their versatilitys is what makes this system indispensable.